After a seven year delay, work has resumed on a new general plan/resource management plan for the Auburn State Recreation Area (“ASRA”). Development of the new plan was suspended in 2008 amid uncertainty about ASRA’s longterm future. With adoption of a new 25 year managing partner agreement between the Bureau of Reclamation and State Parks in 2012, the two agencies are again cooperating on a much-needed blueprint for future management of the popular park. The existing “interim” plan, adopted in 1992, assumed that the ill-fated Auburn Dam would still be constructed, and consequently discouraged recreational use and facility development in the American River canyons. Twenty-three years later it seems obvious the dam will never be built, and it is with great anticipation that we look forward to adoption of a new management plan that recognizes the tremendous recreational resource ASRA has become, and that plans for the future protection and enhancement of this Sierra foothill river canyon treasure. Recreational use of ASRA has mushroomed in the last 20 years, jumping from 250,000 visitors a year to nearly one million. State Parks has done an admirable job of managing that growth under challenging circumstances, but clearly new strategies are needed in the face of the park’s ever increasing popularity. If the turnout at the first public workshop held since work on the general plan resumed is any indication, public interest in helping shape those strategies is sky high. 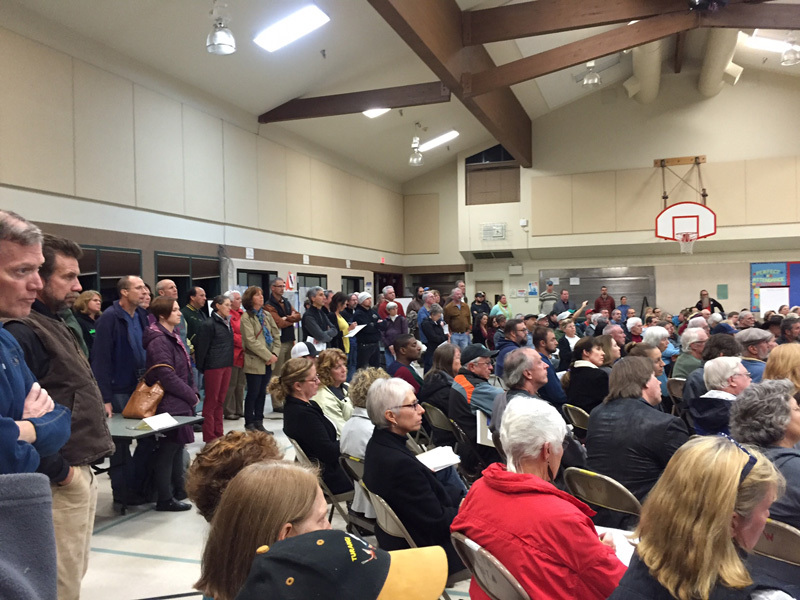 More than 200 people packed the Skyridge School gymnasium in Auburn on November 12 to offer their suggestions on how to make one of California’s greatest state parks even better. PARC has offered its own proposal for development of the new general plan. “The American River Confluence Parkway,” published in 2004 discusses the key issues we believe should be addressed in the plan, emphasizing the need to balance resource protection with enhanced recreational opportunities for park visitors. The Confluence Parkway proposal focuses on that portion of the canyon lying directly below the City of Auburn, and calls for additional trails, improved canyon access, and the construction of a trail bridge across the river at China Bar. We believe this part of the canyon, with its proximity to Auburn and existing network of trails and access roads on both sides of the river, along with boating access to the manmade rapids at the former dam construction site, has the potential to become a premier recreational venue in its own right. reconstructed river channel as part of Placer County Water Agency’s pump station project. trail users have been unable to cross the river and take advantage of additional trail options such a crossing would afford. The solution to this problem is simple: the construction of a trail bridge at China Bar that links the trails on each side of the river, adding much-needed trail connectivity and spurring visitation to a fascinating but currently under-utilized part of ASRA. PARC believes a trail bridge at China Bar should be one of the new general plan’s highest priorities. ASRA is only going to become increasingly popular in the future, and something has to be done to improve access to some parts of the park other than just the Confluence, which often reaches its vehicle capacity on weekends. China Bar is a great option to fulfill that need, with easy access possible by existing roads and trails. A new bridge across the river, coupled with expanded access by the existing roads leading to China Bar, is the key to making this happen. We encourage you to submit your ideas for the future of ASRA as State Parks develops the new general plan. Comments and suggestions can be submitted by visiting www.parks.ca.gov/PlanASRA. In your comments, please urge State Parks to make construction of a bridge at China Bar an essential goal of the new plan! ﻿The American River Confluence Parkway project is a Protect American River Canyons initiative that involves engaging and building community and agency support for a new general plan for the Auburn State Recreation Area (ASRA) that will emphasize resource protection and restoration, enhanced recreational opportunities, increased public safety, and diverse community benefits. SEE THE ARC PARK PLAN! 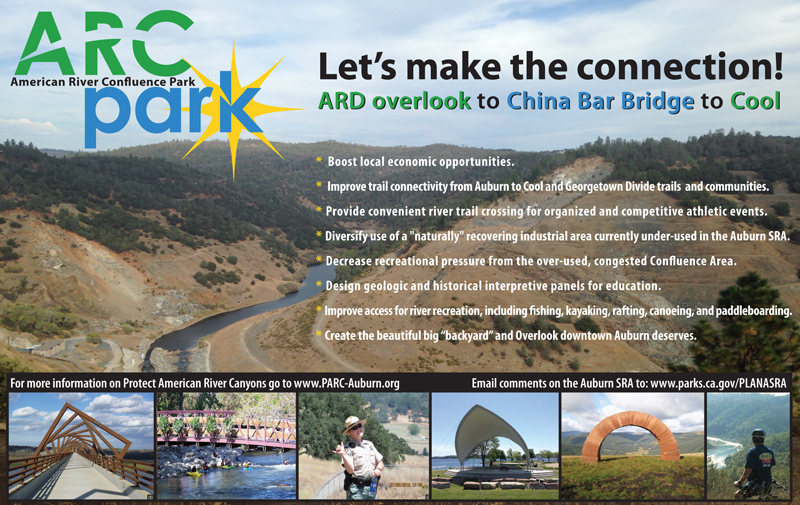 See the American River Confluence Parkway (ARC Park Plan) here. See the American River Confluence Parkway, Auburn State Recreation Area Map here.